Whether you need a grab to go lunch or you want to have a proper sit down lunch, East caters for all with its traditional Vietnamese food. Vinh Ngo is the owner of the newly opened, East Cafe and Vietnamese Bistro. At the same time, he is also studying towards a medical degree. When Vinh is not studying or doing his rotations at hospitals, you can find him at his cafe. Coming from a Vietnamese family and growing up eating a lot of the food that he serves, you can rest assure that the food is authentically Vietnamese as Vinh’s mum also assists him in his cafe and teaches her recipes to the kitchen staff. To start off the lunch, Vinh brought us some Banh Mi ($ 6.50) or Vietnamese Baguette with Traditional Vietnamese Pulled Pork. You can also choose from Traditional Vietnamese pulled pork, roast pork, BBQ pork, grilled chicken, grilled steak, meat balls and vegetarian salad. 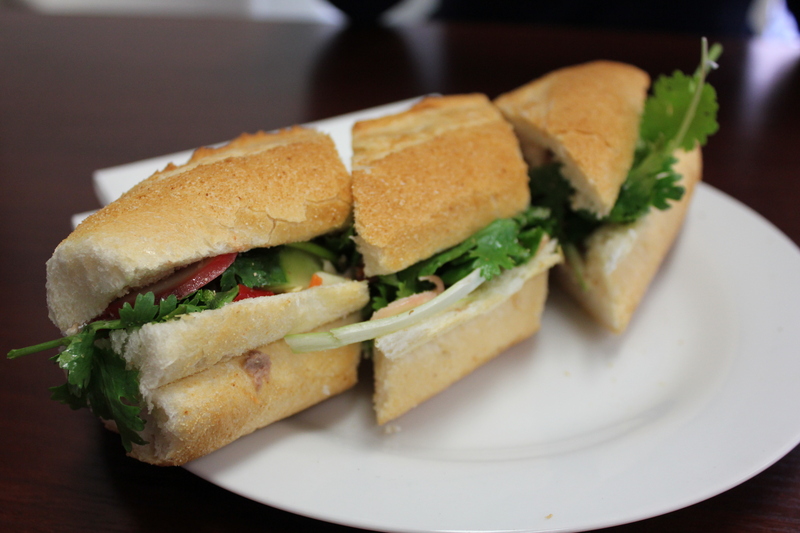 The Banh Mi is a perfect grab and go lunch if you are in a hurry. My family and I enjoyed the Banh Mi and we thought that it was delicious. The flavours were very fresh. From my observations, it is also one of the most popular dish at East too. Our food arrived not long after. 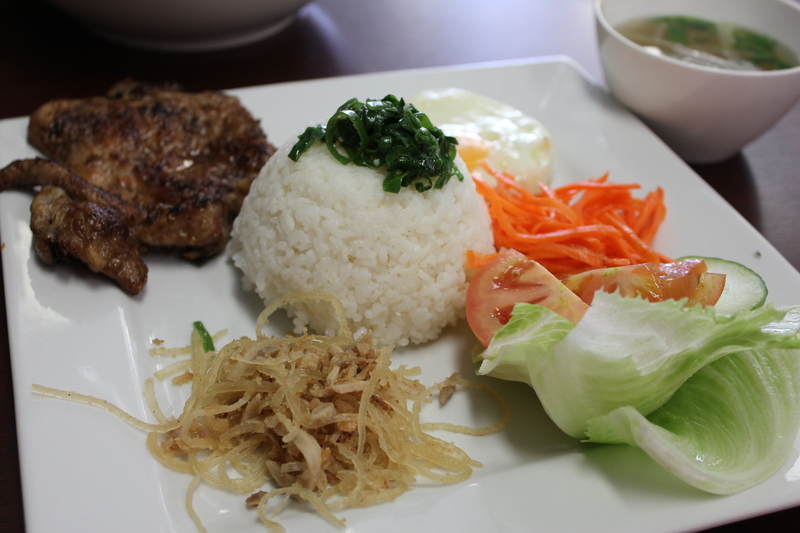 I had the Com Tam Dat Biet ($12) which consists of broken rice, grilled pork chop, egg and pickled vegetables. The broken rice was soft and fluffy and the pork chop was grilled to perfection. It was a very tasty and hearty dish which I know that it will last me for the whole afternoon. I was very satisfied. My dad had the Pho Dac Biet ($11.50) which is a Beef pho noodle soup with only the sliced medium-rare beef and meat balls (It usually comes with tripe and beef brisket too, but dad only wanted the sliced medium-rare beef and meat balls) I had a taste test of the Pho and it was delicious. 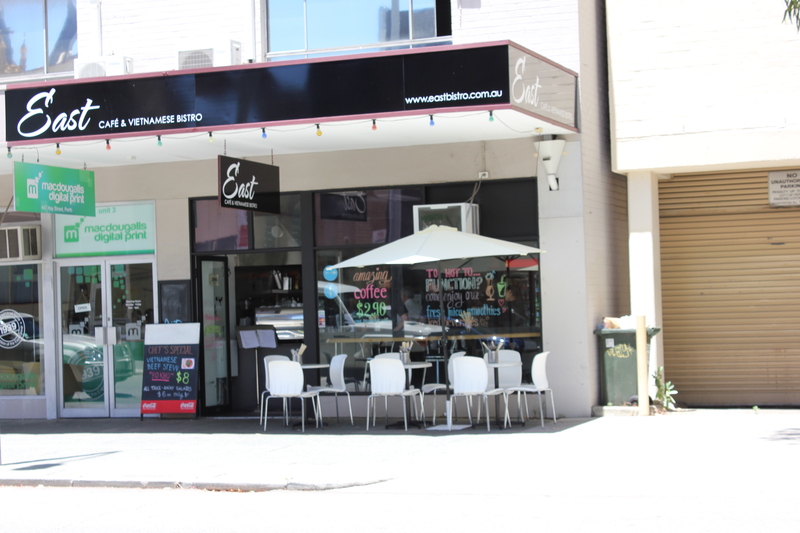 Compared to a lot of Vietnamese restaurants around Perth, the soup at East was not very oily which is usually quite hard to achieve. The beef pho noodle soup was full of flavour, scrumptious and the beef was very tender. 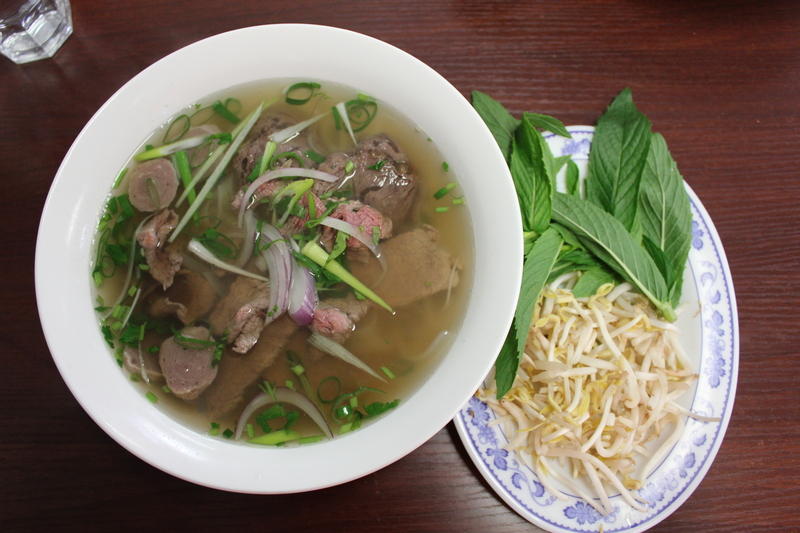 Overall, the pho was very authentic and was executed very well. 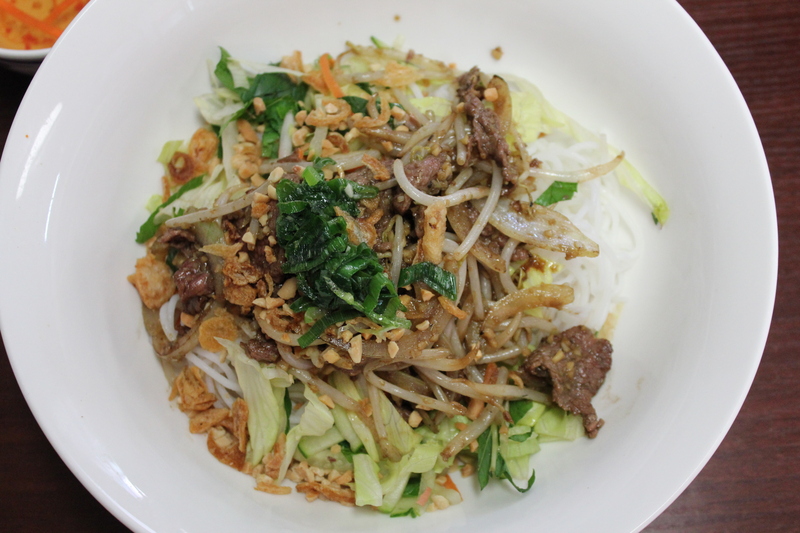 Mum had the Bun Bo Xao ($10) which consists of rice vermicelli, stir fried beef, lemongrass and cashews. Mum enjoyed her dish a lot and thought that it was very tasty, fresh and bold in flavour. The Bun Bo Xao would also be a great dish to have on a hot summer’s day too as it is light and refreshing. 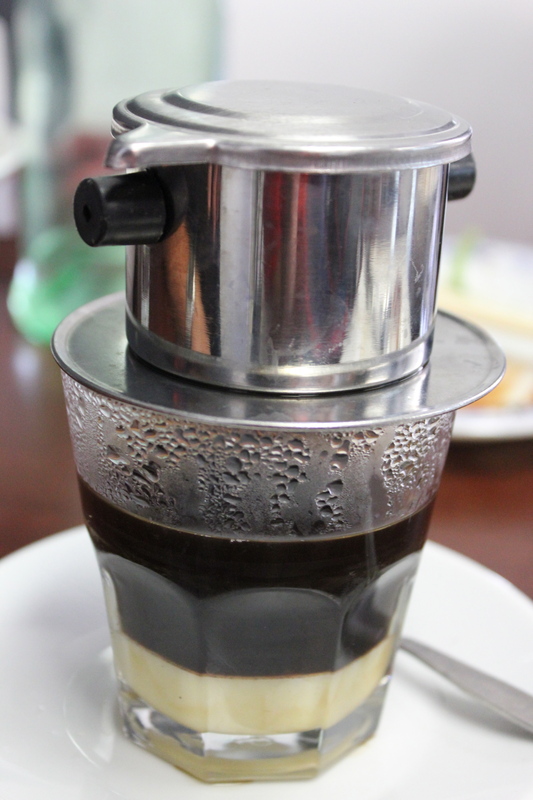 To finish off our lunch, we had the Vietnamese Coffee ($3.50) which is the famous Vietnamese filtered coffee with condensed milk. After 5 minutes of filtering, we were excited to try the coffee. It was authentic, heavenly and definitely comparable to the ones I had in Vietnam before. The coffee was very fragrant and for a second, I thought that I went to coffee heaven. Just as I was about to finish lunch, the cafe was very busy as it was the peak lunch hour. (You can probably tell that the main customers at East are mostly office workers) Overall, my family and I enjoyed dining at East and we will definitely be back again to try other dishes on their menu. I highly recommend East for good, authentic and hearty Vietnamese food. Oh, and the ample parking space at the CPP opposite East is an added bonus too!